Including thrilling attractions such as water bobsledding and the wild river water slide, go karting, the trapeze, the merry-go-round, footbath, and an open area for playing in the water, this is a complete leisure facility where it is impossible to enjoy everything in just one day. The suggested season is summer. Get on Joetsu Line from Echigo-Yuzawa Station and get off at Joetsukokusai Ski Resort. 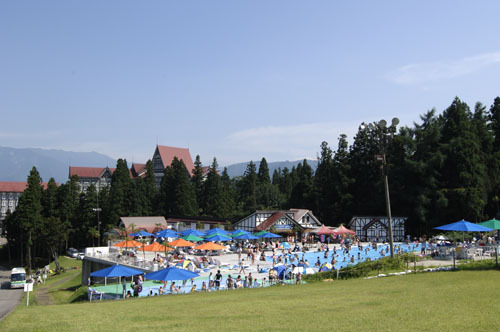 You can enjoy a breathtaking view of the mountain range of Uonuma.